Don't forget to check out my Braiding Page for links to knots, hemp, friendship bracelets, macrame, thread, gymp, etc. Includes some great animated and diagramed sites. For those people looking for Jewish safety pin projects check out my beadie page and the links on this page to SWAPS and Safety pin projects. There are links to Israeli Flags, Dreidels etc. 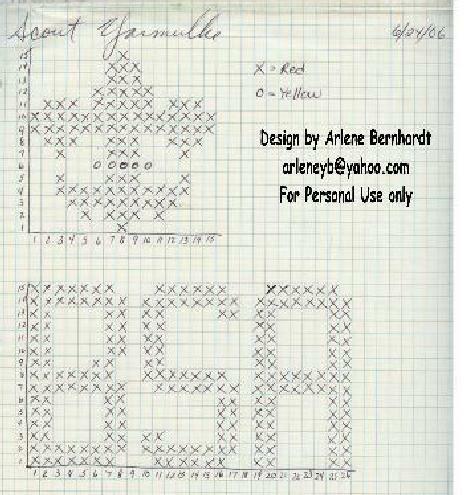 Any of the Eileen's Original Projects on this page can be done in a Jewish setting using Jewish Clip Art or Symbols. Look below for Jewish Resources for clip art. One Jewish project that works for Jewish Scouts is braiding challah bread. Teaching the scouts to make real challah is a great project. Braiding challah can be easy as a regular three piece braid. It also can be more complicated and made into a braided round challah. I have also seen great challahs for weddings and bar mitzvahs that have 6 or 8 pieces! The challenge though is to keep the scouts from eating their challah before they can take them home. In the camp I taught in, challah was made every week. Dough was made on Thursday, let rise and braided and baked on Friday. A major job for the challah person. (100+ small challahs a week) The next challenge was to keep the kids from eatting the challah on the way home! Since kids want THEIR challah to take home, you need to label the challah while baking. Many groups make a diagram with the children's name and position. The challah taken and burnt is used to mark one corner so you know the tray position. Some camps bake the challah on parchment papers with the names on the paper. Others use popsicile sticks with the kids name in permanet marker. The stick is put on the bottom of the challah and will stick long enough to label the challah until you bag the challah. Of course each bag has to be labeled as to the childs name and group. Clay Challahs and Play Shabbat Sets. Making clay challahs out of polymer clay or homemade clay is also a great project. Children love to "play" Shabbat. 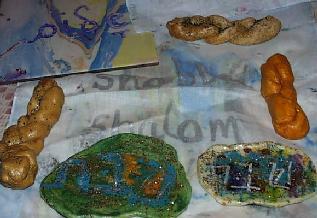 We have made mini shabbat sets with: clay challahs, popsicle stick challah boards and clay kiddish cups. We have also painted fabric for a mini challah cover. Challah boards out of homemade or polymer clay is also a fun option. I have used Magic Dip paint to turn hankerchiefs into Shabbat and Holiday Challah Cloths. Also in the above pictures is a large ceramic tile we used Magic Dip paint to tie die into a challah board. Make sure that a child's name is on every project as they forget what their projects looked like. But I love to also mark the year, parents love the memory. Challah Board or base to place Shabbat Candles. Magic Dip is one of many options for painting on fabric, plastic, tiles etc. The kits show up at different craft and toys stores. They can be bought online directly from the woman who invented these paints. Magic Dip is an oil based paint that floats on water. You use a large container (I always used a fish tank to the kids could see the dipping) of water. It is best to work in a room with windows open or outside. We hung clothes by clothes pins to let them dry being careful not to fold the clothes as the paint will ruin if it touches it self. See My Supply Source Page for info on Magic Dip and other craft companies. Clay on Glass projects are fun and look very professional. 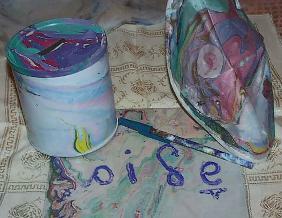 Kiddish cups, Elijah or Miriam Cups for Passover are all great projects. Check out my new Clay on Glass projects for directions for these Kiddish Cups and Clay on Glass Star Candlesticks. See My Baby food jar crafts for directions. Baby food jar crafts are great. It is amazing if you give your friends and campers some warning , how many free jars will be delivered to you. I put in our bulletin in the spring that I will need this for summer crafts. Havdallah Beeswax candles are great to work with. See my Candle and Havdallah Candle pages for directions. A great way to teach a Jewish skill and still teach knots. Teach scouts how to tie their own Tallit/Tzitzi knots! See my Braiding page for more info. Coming soon picture of my son's Sunday School Project of making his own school prayer shawl. Eileen's Jewish Resources and Supply Source Page. My Jewish parent teacher page is perfect for Scout Leaders. Israeli Flag Pin by "Raspberry Hamentashen" now hosted on my site. (With permission of designer.) Includes modified directions for turning the swap pin pattern into a beadie design. Girl Scout Troop 8909 of San Diego, has a web site with links to other Girl Scout Troops, National Jewish Girl Scouts and National Jewish Committee for Scouting (girls & boys in the U.S. and Israel). It also has holiday ideas and some fun sites. Some of the serious sites it links to are about Ellis Island, Anne Frank and more. National Jewish Commitee on Scouting It has a huge amount of information and lists of Jewish Troops all over the world. It has great resources including: Clip Art for Jewish Scouts,WWW Jewish Resources and more. This is the official Jewish Girl Scout Committee. It lists all of the Jewish badges that a scout can earn. Shows pictures of the badges and tells you where you can buy the handbooks for these badges. They also have other resources for scout leaders with kits and books you can order for a very moderate price. Plus many free publications. It lists information about their uniform, emblems, rules etc. This the site for all Israeli Scouting including: Catholic, Druze and Arab Scouting. Although Druze are the only one where they have a link to. They also list links to different Israeli troops on the net. They have information about Israeli Scouts including the Hebrew Scouts Delegation that send representatives to America to teach at camps and to preform. They have visited our city a couple of times and they were incredible! For a small city like us it was a real treat. Dreidel game and some help earning a badge. Although currently these stores do not carry Jewish specific crafts, the general supplies are so handy it is a must for all scout leaders. Her craft site http://www.makingfrieds.com has many great crafts and some Jewish projects or Bible projects that can be used by Jewish teachers. A must to visit online! The first place to look for scout craft supplies. Check this store out. Makingfriends.com and it's store has made it easy to buy bulk packs for Scout leaders to earn a badge. Check this out it is incredible and very reasonable.! 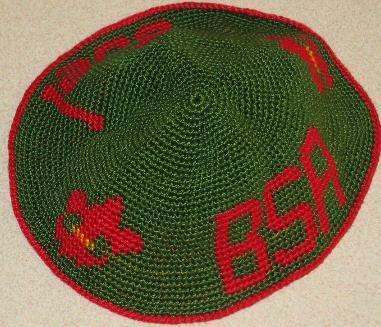 Arlene Bernhardt who made this kippah for her son. Thanks for letting me post the chart. Of course these are available for personal use only. The chart was used to plot when to change yarn color when crocheting. I think it can also be used for cross stitch, hand embroidery etc. Possibly you can use the chart with plastic canvas to make bookmark etc.